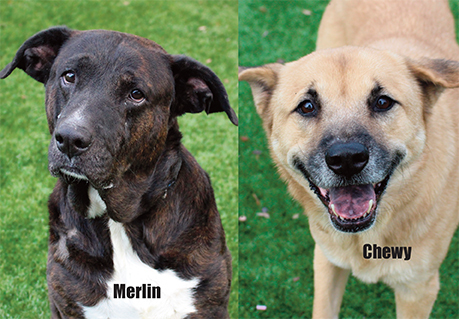 Merlin and Chewy looking for new homes for the holidays! Brandon Honda is trying to place as many long-stay dogs as possible from the Hillsborough County Pet Resource Center (PRC) through Dec. 31, 2018. Chewy and Merlin urgently need adoption to avoid near-term euthanasia. Adoption fees are waived for all PRC long-stay dogs adopted through the end of the year. Merlin is a beautiful, 6-year-old, neutered male Brindle that weighs 90 lbs. He’s a very low key boy who knows basic commands, enjoys treats, and tolerates other dogs in playgroups. He enjoys being outside. He’s been dog number A1946443 at PRC since October 31st and is looking forward to a new forever home for the holidays. Come meet these adorable dogs on Thursday, December 13 and December 20, from 2 to 5 p.m. at Brandon Honda and help us find them loving, new homes. Chewy is a sweet, 14-year-old, male tan and black Chow Chow mix weighing 55 lbs. He has been neutered, is friendly with adults and likes to play with toys and explore the outdoors. He has been dog A1950258 at PRC for since Nov. 14, 2018 and his time is running out. PRC personnel will be on hand to answer questions and provide convenient, on-site adoptions. In addition to being neutered, they are microchipped, have had a rabies vaccination and a heartworm test, and will be gifted with a doggie swag bag from The New Barker magazine filled with doggie treats and gifts. “Test Drive a Shelter Dog” at Brandon Honda is part of the national #GetEmHomeChallenge, a three-month contest offered by Maddie’s Fund at https://www.facebook.com/97127614282/posts/10156847162024283 toward its mission finding a forever home for all shelter animals. We’re trying to help PRC win up to $50,000 in grant money to help cover medical exams and treatment, as well as defray other operating costs. For more information, visit https://www.maddiesfund.org/index.htm. The New Barker is a Florida-based, lifestyle magazine about dogs that reaches nearly 30,000 dog lovers quarterly. For more information, visit www.TheNewBarker.com. Project RAD Foundation https://www.instagram.com/projectradfdn/ is a nonprofit organization founded by Marissa Marazzi to help save homeless dogs through digital marketing and technology solutions. The Hillsborough County Pet Resource Center https://www.hillsboroughcounty.org/en/locations/pet-resource-center is located at 440 N. Falkenburg Rd., Tampa, FL 33619. It can be reached at (813) 744-5660.